Dremel is surging forward with the launch of two new high performance Multi-Max tools, the Dremel Corded Multi-Max MM20 and MM40, which take on tasks that require increased power and versatility. Both tools re perfect for home improvements, the installation of cabinets, cutting drywall, sanding down paint, grout removal and making circular cuts in concrete or drywall, flush cutting in laminate, as well as, a whole range of tough projects around the home. And the superb range of diverse Multi-Max accessories ensure that the job gets done in comfort and with ease. The Dremel Multi-Max MM40 uses a new high performance 270W motor for the most demanding applications. The wrench-less 'QuickLock' feature enables tool-less, fast and secure accessory changes with a simple turn of a lever. It has a speed/oscillation per minute of 10,000-21,000 across a variety of materials and there is a seven foot rubber cord for a wide working range. Its electronic feedback maintains constant speed with even the toughest applications and materials - and the Up-Front on-off switch allows one-handed use whilst retaining its speed setting. 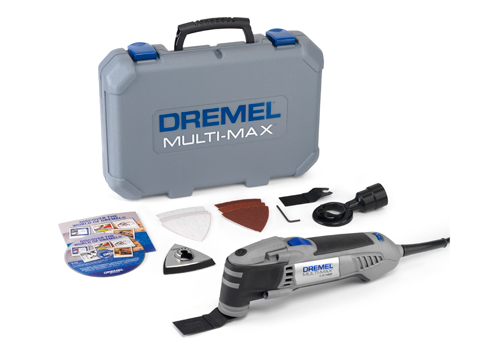 With the Dremel Multi-Max MM40's enhanced features it is also suitable for professional use. The Dremel Multi-Max MM20 is the most ergonomically-optimised soft-grip oscillating tool yet, designed for comfort and control. Its 250W motor with electronic feedback has a higher performance specification than the original Multi-Max and is as powerful as many professional oscillating tools. It has a Quick-Fit accessory interface allowing for accessory change twice as fast as normal. 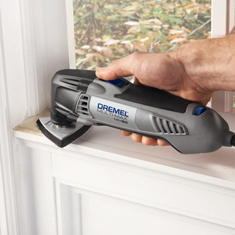 The Dremel Corded Multi-Max MM20 has a power rating of 250W and a speed/oscillation per minute of 10000-21,000. Its compact design provides easy access to tight areas. This new tool gives DIYers the professional oscillating tool performance they've come to expect - and more. Available from Dremel Direct and Beesleys Tools immediately. And from Amazon from February onwards.